I was at an antiques show recently and listened to several dealers debate the beginnings of the sterling standard in this country. I was surprised that there were as many opinions as there were dealers arguing. The main contenders for first to market with American sterling were Tiffany, Gorham, and one Joseph Trowbridge Bailey, who worked in Philly around 1850 and eventually partnered with Banks and Biddle. Is there a consensus as to when and whom? And was there an event or circumstance that propelled the change? The first, who, has to be qualified. Sterling grade goods had been made here since Hull and Sanderson, but without a consistant intention to do so. The first to set up a dedicated sterling structure was probably Bailey, adopting a mark for such in early 1855, though the company states 1852 in its history. Similar claims, however, were made by other firms. There is no definative documentation independent of company propoganda, so it will remain an open question. The second, why, is easier -- market share and snob appeal aimed at the growing upper middle class. Interesting... it certainly does beg the question why the early goldsmiths didn't just keep the British sterling standard since, with the exception of New York, most colonists were of English extraction and some were trained there. Scarcity I would guess might be the main issue, such that the coin standard started in the first place--melted down coinage might have been the main source of silver until Americans found their own supplies out west. All speculation unless someone has an authoritative source? Mind that very slippery term "coin." As a specific of silver content, it is relatively late in invention and had more to do with the competition created by the introduction of mass produced silverplate goods than anything else. In that, it was a sales and advertising term and not always lived up to. Colonial silver varied widely in metal purity, ranging from .700 to .975. Silversmiths took their materials where they could find them -- as raw stock, scrap bought in, old wares supplied by customers for remaking, or coinage. The ultimate purity of the metal was a function of time, facility, desire, and scarcity. I so rarely know as much as wev or disagree with him, but now is my chance, twofold. If I understood him correctly, he has skipped several silversmiths here that used and marked their silver sterling before 1850. Though not the earliest the most prolific was Chaudron & Rasch who included their mark “Amer. Ster. Manu”. I presume that counts as much as the later use of “English Sterling”. There was also a Baltimore silversmith who marked his work “Sterling” c. 1800.although his name eludes me for the moment. I think there was a Magazine Antiques article on it some years back. The second may be nit picking, but I don’t think you can even say the bottom end of the standard is .700 fine. I have seen to pieces that I doubt even made it to that standard. One was a Phila. spoon but the other was a tea set (again the maker’s name eludes me) supposedly made for one of Washington’s generals. It had descended in the family of the general. It seems unlikely that it was a scam by the silversmith; I just presumed the General wanted a tea set, but didn’t really supply enough silver for one. Both the set and the spoon had a decidedly yellow brassy look to them, and although I can’t accurately test for silver with acid, my experience would say they could have either been as low as .600 fine. There was only one formal assay office in the Early Republic which enforced silver standards. From 1814-1830 there was compulsory assaying for locally made silver in Baltimore; the act was repealed in 1830, but the office remained in operation and assaying continued on a voluntary basis until 1860. Silver assayed between 1830 1nd 1860 was marked only with a standard mark - either 10.15 (84.58 - content of the Spanish Dollar) or 11/12 (91.66). Silver in the earlier period bore hallmarks - the only true American ones - and dates letters assigned on the Dominical system (very hard to understand, and not assiduously adhered to). An excellent essay on the history of the Baltimore Assay Office and its markings by Patrick Duggan is to be found in Silver in Maryland by Jennifer Goldsborough. N.B. Prior to 1814, there were a number of Baltimore smiths who marked their silver "STERLING" in the Irish fashion. Presumably. it was made from remelted English Sterling, but there was no assay office to confirm it. Under the various British laws governing the colonies, were some that precluded colonials from producing things that would compete with products made in England. Thus, sterling could only be produced in the British Isles. Elsewhere, a different standard was in use because of this law. The finest silver quality came from England, the colonies could produce only imitations. That is my understanding of the long term use of coin silver. Dale, how sure are you of that particular statement? I ask this with respect, for in over 30 years or looking and learning about the stuff (silver) that's one I hadn't heard. Yes I know that the Brits did have trade regulations for their colonies, but I do doubt that there was a specific law/regulation against manufacturing silverware using the .925 standard. And I'm sure that afficionados of French silver (among others) may care to dispute that British silverwork set the standard! OK I will pick on some of the responses, in no particular order. I believe, and we will have to ask our resident silversmith, that the reason colonial and later American silver was usually sterling or less in quality was that it is easier to produce silver without refining it. Meaning that if someone brings you .900 silver it is easier to make .900 fine silver objects from it than to raise it to .925 fine silver. This was the reason why France changed to a higher standard of silver, than their coins, it made it harder to melt down hard currency. I am not sure what point Dale was making, but since Britain had nothing to say after 1776, and did no testing before that date the point seems almost mute, except of course that the colonials couldn’t call it “sterling”, during that period.. I think his information might be very important, although not responsive to the original question. The usual discussions I have heard are that we didn’t assay and therefore didn’t mark. Of course this doesn’t make a lot of sense, when you think about it. The truth is we couldn’t use English sterling marks, and we couldn’t (if Dale is correct) set up our own Sterling marks. This fits in well since the first silversmith to use “sterling” in his mark was Irish. (OK I still haven’t found my reference). Thank god Chaudron and Rasch weren’t the first to use “sterling” as a standard, who wants to be obliged to a Swiss and a German. Stuart is correct that Baltimore is the only place which had a standard. But their standards were not “sterling”, so it doesn’t answer the question. I believe that the situation was one involving trade protection - as I understand it, the Crown would not allow raw silver or bullion to be exported to the colonies in order to protect domestic silversmiths (and the balance of trade), which would force the colonists to import ready made Sterling silver objects from England, but they apparently did not prohibit silver from being made in the colonies if obtained from other lower grade sources, nor did they assay to ensure that sterling coins were not being used. Until the discovery of the Comstock Lode in the 19th Century, there was no commercially viable domestic source of high grade silver ore, so the colonists relied on remelted coins and old silver to produce new objects. Coins of several nations circulated freely as legal tender, but were of varying standards -- chief among these were Spanish Dollars, many of which were obtained through privateering of Spanish ships carrying newly minted coins and other silver (and gold) objects from their Latin American possessions, as well as through trade with the West Indies and other places. These practices grew as they were carried over into the New Republic, and when a standard was finally adopted, it was the standard to which American coins were to be made. In common usage the term "coin silver" has come to have different meanings, then, depending on the period in which an object was made. Objects made prior to the adoption of a formal coin standard have come to be referred to as "coin silver" because of the common practice of using coins as a source of material for fabrication, whether or not the object was actually made from remelted coins. As the silver used varied in content, no standard applies. After the adoption of the official coin standard, the term has come to refer only to silver of that standard, and only to American silver. Objects were openly made of Sterling, or only of specific coins of set standards (Spanish dollars, francs, etc.) and so marked by a few silversmiths, after the Revolution, but other than in Baltimore, as discussed above, there was no policing of any standard - there was only the reputation of the silversmith to back his claim. Modern analysis of old objects has shown that the content of silver made in the pre-coin standard period varied widely. I suspect that most silversmiths had neither the ability nor the desire to refine remelted silver to any particular exacting standard. After the adoption of the coin standard, (and later a Sterling standard) commerically refined silver stock could be bought in for use, and old silver taken in by silversmiths could be sent on to commercial refiners for processing. No apology necessary, I don't know the expression in English but it is something like "great minds think together". I agree and must admit, I could have misinterpreted the term “standard’ in the question. Obviously the only standard in the sense of “agreed upon standard” was in Baltimore. The truth is Americans at any period until very late didn’t test silver. Every analysis I have seen in reference books showed not only a considerable variance from piece to piece, but also from one place to another on a single piece. To rephrase what Stuart said, if it says “coin” or “pure coin” it was probably too late to have been made from melted down coins. Who knows what “sterling” meant until we come to the companies cited by wev. I am relying on my memory of Economic History classes over 30 years ago. There was something with a name like: The North American Act which stated terms of trade for the colonies. Under this, things that would be competitive with products from the home countries either could not be made or were subject to various duties etc. This was part of the system of Imperialism in which the colonies provided raw materials to the home country which then sold finished products. It is interesting to note how spotty the record of silver production is for all the British colonies, until mid Victorian times. Curry & Preston advertised that they "stamped their wares according to quality, [English] crowns, [French] 5 francs, Spanish dollars, and [coin] standard." (I added the information in brackets.) This implies that the firm was well aware of the varying silver quality of each of the coin types listed, and that they made this known to their customers. Given this information, I doubt that they would have "mixed and matched" the various types of coins into the same piece of silverware. * The English standard of 0.925 fineness is also known as "sterling". * The French standard of 0.900 fineness was equivalent to the United States (post-1837) "coin" standard. * The steadily decreasing quality of the Spanish-American coins is readily apparent in this chart. * The United States standard was changed during the financial panic of 1837. Over the years I have seen many "CURRY & PRESTON" items. Each item also had either the FLOURISH mark or the STANDARD mark applied to it. I have not yet seen a different mark that would indicate the other types of coins. I would be interested in hearing from the members of this group which of the above coin types that the FLOURISH mark would have indicated. I would also be interested in hearing of other known quality-indication marks that were used by this partnership. That Curry & Preston advertisement appeared in 1829. The same enumeration of "standard marks" was advertised in 1826 and 1827 by R&W Wilson (also cited in Belden). The coin standard mark ("standard")is the most frequently seen; it appears along with many retailers names in the southeastern Pennslvania region (and a few beyond) -- many if not most of the spoons I have seen so marked have a characteristic shape recognizable as having originated in the Wilson's large "manufactory." The Wilsons were in business over 20 years under that name (and later as William Wilson & Son), Curry & Preston for 6. It is entirely possible that the Wilsons supplied those spoons to Curry and Preston, in spite of the advertising claims of the latter firm. I am not sure of what you mean by a "flourish mark". There is a small mark resembling a scroll or branch of leaves that might be what you are referring to. Can you post a picture? Thanks for posting the table - it will be a handy reference. Three precious commodities have to be purchased by this Company. One is silver coin, which is the staple material of their ware. The Gorham Company... have now adopted the sterling standard. Hence the necessity for purchasing something besides the daily supply of coin. Coin being the form in which silver is usually bought for manufacturing purposes, the Company are obliged to buy a certain quantity of pure silver for the purpose of raising the standard to sterling... All these precious articles - silver coin, pure silver, and gold - are sold by the coin and bullion dealers of Wall Street. Like other commodities, they are sometimes scarce, sometimes abundant, and occasionally superabundant. The time has been when silversmiths could not buy in all New York five hundred dollars' worth of silver, and they had to run about Chatham Street hunting up little lots of dimes and half dimes that used to be displayed in the windows of lottery shops. Generally, however, large kegs of Mexican dollars are to be seen in the vaults or behind the counters of the dealers in bullion, as numerous as kegs of of nails in a hardware store. Richard, thanks for the reference to the Harper's Magazine article. I probably need to do some searching of the previous posts to this forum. Here are two images of the CURRY & PRESTON marks. There is probably a specific name for what I called the "flourish" mark. I have a coin silver spoon that is stamped with both the "STANDARD" mark and the "flourish" mark. Perhaps the combination of the two marks indicated a certain type of coin. I believe that symbol would fall under the group of marks known as "florets" - I have seen it and others like it on a wide variety of Pennsylvania spoons from Erie to Philadelphia. I believe these marks to be trademarks so far untraced. It has been speculated (without foundation) that some such marks (among them eagles and eagle heads) could signify membership in some sort of guild-like association of silversmiths and represent an agreed upon standard of fineness, but no proof of the existence of any of these groups has yet been presented. The countermark on your coin seems to have been struck across another - can you make out whose mark it is? IBLACK perhaps? Interestingly enough, the circular Philadelphia stamp appears along with a couple of other phm's on an object marked by Joseph Lownes, illustrated in Fennimore's Knopf guide Silver and Pewter. I seem to recall seeing it on a Wilson piece, but cannot recall where. 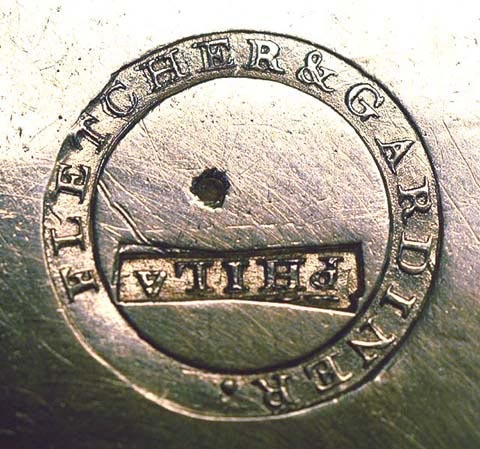 If I am wrong, a guess (amd only that) would be that silver bearing that mark could have originatd with Fletcher and Gardiner, who were major suppliers to the trade in Philadelphia, and who used a similar ring-shaped punch with their names inscribed. The legal standard in the United States for sterling as well as coin began in 1906. 15 USC 296 was enacted on June 13, 1906 and sets forth the standard for both sterling and coin. Sterling being nine hundred and twenty-five one-thousandth parts pure silver and coin being nine hundred one-thousandth parts pure silver. A divergence in the fineness of four one-thousandth parts from the foregoing standards is also permitted by this law. Section 291 of Title 15 prohibits the use of the phrase “United States assay”, or with any words, phrases, or devices calculated to convey the impression that the United States Government has certified to the fineness or quality of such gold or silver, or of the gold or silver contained in any of the goods manufactured therefrom. See www.findlaw.com for other parts of Title 15 chapter 8. What an exceptionally informative thread. Now the question that begs, it seems to me, is how did sterling or coin or any other "standard" get assayed in those long ago days before gas chromatography. Case in point: Sterling has been the silver standard in Great Britain since around 1300. Does anyone know how the early wardens determined, to the third decimal point, what the silver content of an item was? How did assaying work in those days--and how accurate was it? Evidently the assaying was accurate enough in GB to change the standard slightly for Brittania grade in 1697 to .958. That's only .033 difference from old sterling. They must have been pretty confident of their chemistry. So, back to my original question at the start, why did none of this technical know-how and commitment to a standard make it to these shores until 1906? Here is a mark with both the floret and the circular Philadelphia mark. The maker's mark has been attributed to Richard Riggs, who died in 1819, although the other marks also appear on spoons, bearing other maker's marks, that- are assumed to be later. Seeing the PHILADELPHIA mark (within a circular punch) reminds me of an idea I had several years ago after seeing the same "floret" mark on several different pieces of silverware (made by different makers) and on some coins. In this case, the floret mark had a broken "petal" on one side. That is, one of the petals must have partially broken off of the punch, and the punch continued to be used. I was looking at several pieces of coin silverware, and a coin or two, by various Philadelphia area makers, and they all appeared to have been stamped with the same floret punch (! ), in addition to other punches that were specific to each maker. Now, before I go too far with my theory, I want to say that the methods used to prepare die punches sometimes used (hub or master) punches that were themselves made from matrices. This means that some letters and other decorative punctuation were made in quantity from the same matrix, and if the matrix had a problem, the same problem would appear in each copy produced. But this normally occurred with letter punches for coin dies. In my observations, most of the maker name die punches were hand-carved, especially those used by silversmiths. This can be verified by looking at name punches that have more than one instance of a certain letter. If the letters are identical, then a master punch was probably used, otherwise the letter was carved (engraved). After seeing the floret mark being used multiple times, it then occurred to me that there may have been a system of metalware marking in place that is not yet documented. We all know that Baltimore experienced a brief period of assaying mark usage, but this is not known to have occurred elsewhere in the USA. The Philadelphia area may have also had a marking system in place, though perhaps not as extensive as that used in Baltimore. This system was probably not required by law (or we would know about it - wouldn't we ? ), and may have been just a "convention" of the times. Some of the marks (the floret mark, the PHILADELPHIA mark, and possibly others) may have been used for a purpose that is not yet known to us. Perhaps they had a "meaning" that is not documented, as opposed to just being decorative. We have seen advertisements by makers stating that they "stamped their wares according to quality". Yet, almost nothing is known about which marks indicated the various foreign coin qualities that were used (see my earlier post that included the coin quality table - I have been trying to match the marks used to the quality of the silver). I have seen numerous CURRY & PRESTON pieces (they are one of my "pet" test cases), and most of them DO NOT contain the PHILADELPHIA mark. However, the majority of them DO contain a floret mark. Why is this? And why does the PHILADELPHIA mark appear on items from different makers, but only occasionally? The mark has distintive "arrows" on both sides of the stop, indicating that either: a) it is the same punch, b) the punch was made by the same craftsman, or c) the punch was made from a common matrix (close comparison can determine this). Any additional thoughts on this subject? It has been long speculated that there were one or more informal guilds operating in the Philadelphia area, precisely because of the common occurrence of certain pseudohallmarks, but to my knowledge none has been identified. There have been earlier discussions of this on this Forum. I have expressed the opinion before that at least some of these will turn out to be trademarks of suppliers to the trade. Others may turn out to be workers' tally marks. The florets on the Riggs spoon, in combination with the circle mark may be such an instance. I have always suspected this practice was followed in Isaac Hutton's shop in Albany, where several journeymen worked, and on whose producte there are various combinations of eagle marks - to the left of the makers mark, to the right of it, flanking it on both sides, or none. A similar practice may have existed in the shop of Teunis D. Dubois and his brother Joseph, who supplied wholesale silver to many other silversmiths and retailers. A thorough study of this firm and their marks was published in the Spring 1988 Winterthur Portfolio. According to the latest issue of Silver Magazine, D. Albert Soeffling, who has previously identified some groups of New York area pseudohallmarks as trademarks of manufacturing silversmiths, is in the final stages of preparation of a book on pseudohallmarks, in which I expect that he will identify many more. Just to add to the speculation, a work shop that has a connection with another could possibly inherit punches. An apperenticeship served, out work done for years, etc. Punches are still valued enough (machine made $100-150) to snap up if they appear in a masters effects. It should be a simple matter of measurement to see if the punches are the same.